To schedule an appointment, please call 410-531-7557 or click 'Request Appointment'. If you are unable to keep your appointment, please call us with at least 24 hours’ notice; we will be glad to reschedule a more favorable time for you. We ask new patients to arrive 15 minutes before your appointment time if your forms are complete. Please arrive 30 minutes before your appointment time if your forms are not complete. For legal purposes and to protect your medical information, please come to the office to complete a current release form. Please call 800-529-3489 if you have any questions regarding a statement or other billing matter. Tired of playing phone tag? An Internet-based Patient Portal simplifies communication with our office. Whether you want to request an appointment or review your latest test results, the Patient Portal delivers the information you need through a convenient, easy-to-use Patient Portal. Our user-friendly interface is designed to make it easy for you to navigate. NEW MOBILE ACCESS! Access the Patient Portal from any browser on your tablet or mobile phone. Now you can see a consolidated view of upcoming appointments, reminders, labs, and medications. You will receive notification via your personal email account when there is important information awaiting you in your Patient Portal account. If you choose to use the Patient Portal, your name and email address will be treated with the same care and privacy given to your medical records. Patients (over 18 years old) and their legal guardians can sign up for Patient Portal in accordance to the Terms and Conditions of the website. In order to participate in the Patient Portal, our office must have a valid email address for you. New patients will be asked at the time of your first visit (and established patients at your next visit) if you would like to register for the portal. An email address will then be entered into our system and a username and temporary password will be assigned by the software. You will also get instructions on how to navigate to the site. After approximately 30 minutes you will be able to go online and register for the Patient Portal and we encourage you to change your password at that time. Approximately 7-10 days before your first appointment that follows April 1, 2016, you will receive an email notifying you that a copy of your Personal Health Record has been sent to your account at NextMD.com. You will not, however, be able to register until you get your user name and temporary password which you will receive when you arrive for your visit. You will also get instructions on how to navigate to the site. We encourage you to change your password when you register on the site. If you have any questions about the portal or about registration, please call the office. 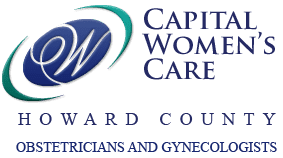 Discover the benefits of uniquely contemporary women’s healthcare at Capital Women’s Care Howard County. Call 410-531-7557 or request an appointment today! Visit us if you are a resident of Laurel, Maple Lawn, Columbia, Ellicott City or Fulton in Howard County, Maryland or a bordering area.